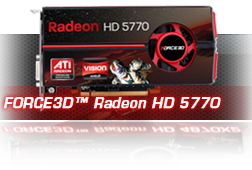 ATI Radeon™ HD 5000 Series graphics processors are the most technologically advanced and feature rich GPUs AMD has ever created. HD 5970 Raise the bar! 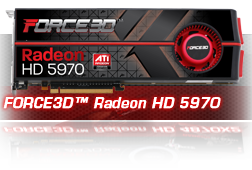 Force3D™ Radeon HD 5970 - the fastest graphics card on the planet! It delivers an unrivaled HD gaming experience so you can play the latest, most demanding HD titles like never before. Engineered for speed, this next generation powerhouse delivers unprecedented performance straight out of the box. 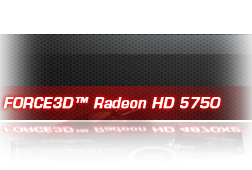 Prepare to experience a riveting high-definition gaming experience with ATI Radeon™ HD 5800 Series graphics processors. Expand your visual real es-tate across up to three displays and get lost in the action with revolutionary ATI Eyefinity Technology. Using ATI Stream technology, accelerate even the most demanding applications and do more than ever with your PC. The first to deliver full support for Microsoft DirectX® 11, these GPUs enable rich, realistic visuals and explosive HD gaming performance so you can dominate the competition. 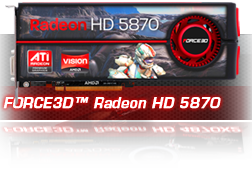 Force3D™ Radeon™ HD 5770 & 5750 Cut Above the Rest! 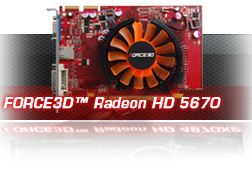 Force3D™ Radeon™ HD 5670 Game Differently - Game in HD! 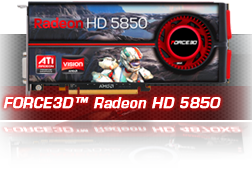 Prepare for tomorrow with ATI Radeon™ HD 5670 Series GPUs which offer forward thinking technology and incredible performance scalability. With full DirectX® 11 support you can enjoy eye popping visuals, astonishing realism and fast frame rates. 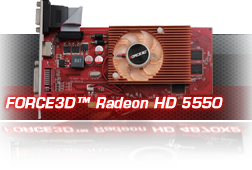 Force3D™ Radeon™ HD 5550 experience real innovation in DirectX® 11 gaming! Now, more people than ever can experience real innovation in DirectX® 11 gaming with ATI Radeon™ HD 5500 Series graphics processors. Loaded with advanced technology, these GPUs have the power and premium features you need for fully immersive gameplay. Using ATI Stream technology, accelerate even the most demanding applications and do more than ever with your PC.